Next time you spot an airliner flying overhead, consider that it would have looked virtually the same back in 1960. But the shapes of today's jets are about to see dynamic changes. Almost every commercial jetliner, from the first Boeing 707 to the jumbo 747 and the superjumbo Airbus 380, features the identical tube-and-wing layout: a cigar-shaped fuselage with engines hanging off a pair of wings at the midpoint, and a trio of stabilizers at the tail. Airline-tried and passenger-tested, this arrangement is pretty much how jets have always looked, so it's no surprise that it's what today's designers still consider the best and safest way to fly the friendly skies. As the aviation industry gears up for its next generation of redesigns, the archetypal airframe is showing amazing staying power despite a half-century of astonishing innovation in aerospace technology. 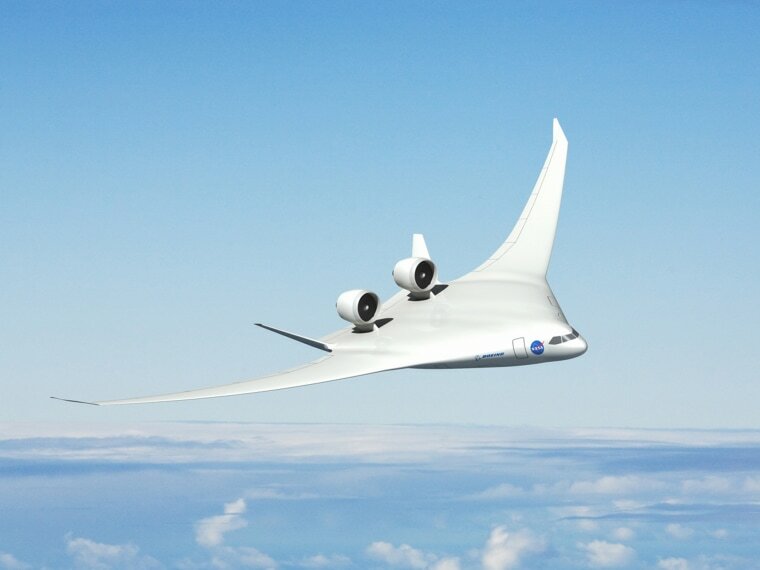 NASA's New Aviation Horizons initiative, an effort to explore large-aircraft designs and greener technologies is currently unfunded and on hold. But the four chief contractors for subsonic concepts — Aurora Flight Sciences, Dzyne Technologies, Lockheed Martin, and Boeing — successfully completed their research contracts, Heidmann reports. One of the initiative's goals is to craft airliners that burn half the fuel of current jets and generate 75 percent less pollution while being much quieter. This airliner "combines the benefits of hybrid-electric propulsion with the proven tube-and-wing configuration,” Heidmann says. Such a BLI-demonstrator could be possible in five to ten years. Inside its rear-mounted power pod is an electrically driven fan that provides propulsion while also ingesting much of the slow-moving boundary layer air that flows next to the fuselage. This low-energy air enters a front intake vent and is blown out the back, reenergizing the plane's wake to cut aerodynamic drag. BLI technology is also the "make-or-break" aspect of Aurora's D8 Double Bubble concept, says John Langford, company chairman and CEO. The D8, which is being developed in concert with MIT and Pratt & Whitney, moves the engines away from the “clean” airflow conditions below the wings to the top rear of the double-wide fuselage. Langford is confident BLI propulsion will work just fine on the D8. And because the design's double-wide, oval fuselage creates a significant amount of aerodynamic lift and its engines are integrated into its surface, the wings can be smaller, ensuring that the plane will fit at existing airport gates. “Of all the X-Plane concepts, it's the least disruptive to the airlines and the airports,” Langford says. This artist's concept of the X-57 Maxwell shows the plane's specially designed wing and 14 electric motors.NASA Langley/Advanced Concepts Lab, AMA, Inc. Ideally, all these aircraft would be powered by clean, green electrochemical batteries, but current technology doesn't provide all that much power for the weight, which severely limits range. The necessary number of batteries for NASA's X-57 prototype, estimated at about 800 pounds each, would weigh down the fuselage considerably. Put another way, the jet-fuel capacity of a Boeing 787 Dreamliner is reportedly around 223,000 pounds. A battery pack that can store an equivalent amount of energy would weigh about 4.5 million pounds. Related: Could This Be the Battery That Revolutionizes Our Cars and Phones? Airbus engineers estimate that a regional aircraft might require up to 20 megawatts of power, which would mean that its batteries would need to be ten times more powerful than any available today. Failing a major breakthrough in battery technology, these electric jets will need to rely on hybrid power plants similar to the one used in the SPARC-ABL concept. NASA is sponsoring the preliminary design of a quieter, “low boom” demonstration aircraft — the Quiet Supersonic Technology (QueSST) — by Lockheed Martin. Following feasibility studies and efforts to better understand maximum acceptable sound levels across the country, the QueSST project aims to produce a plane that creates a relatively soft thump rather than a big boom.